And Loving Husband is thinking the same thing. Attention-deprived Dog is running back and forth, but the two sleepy-drenched individuals drown out his presence. Sleep is sweet. Sleep is so sweet. But it can turn sour 4 minutes before you have to be out the door. It’s a precarious timetable and flirting with the alarm is risky, but some days you just have to flirt. BEEP. BEEP. BEEP. Or in this case melodious music that never pushes past 10 notes. Sleep-medicated hand fumble, fumble, slaps! And it’s off! Dog shakes around its name tag. Husband and Wife tune him out again. Just a few more minutes! Happy Wife jumps out of bed and precedes to make bed with husband still inside. Loving Husband panics calmly. Happy Wife panics like a headless chicken. She runs and flails. She slaps on makeup and wipes sour sleep off her face. Loving Husband feeds the dog and bides his time. He even stops to make a pot of coffee. “These grounds will have to do.” He’s called Loving Husband for a reason, you know. He prepares himself in less time than Happy Wife, and he even made time for responsibilities and brewed coffee. Happy Wife is still oblivious to the coffee, until she clippety-clops past the coffee pot. First, she is amazed that her husband made them coffee. But amazement pauses in mid-thought, because she is pretty certain that he didn’t use the regular coffee grounds. She organized recently, and things can be hard to find when a wife is always trying to find the most efficient solution. “The jar underneath the sugar!”, he replies instantly. Four minutes to 8 doesn’t leave you with much choice. 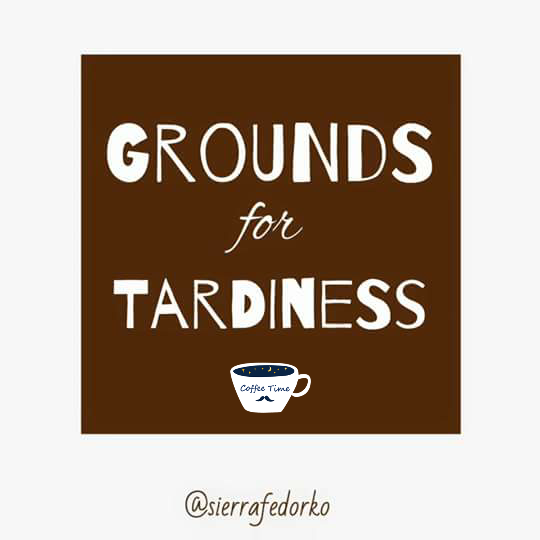 You accept the grounds of tardiness and you embrace it.